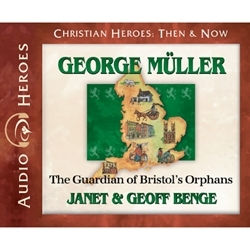 George Müller stared at the beggar girl. She was no older than five and was piggybacking her little brother. Her mother had died in the cholera epidemic sweeping England. Her father had never returned from the mines. Standing in the muddy street, this little girl gave a face to Bristol's countless orphans. With scarcely enough food or money for his own family, George Müller opened his heart and home. Sustained by God's provision, the Müller house "Breakfast Club" of thirty orphans grew to five large houses that ultimately over ten thousand children would call home. George Müller trusted God with a depth rarely seen. His faith and generosity set a standard for Christians of all generations. (1805-1898).